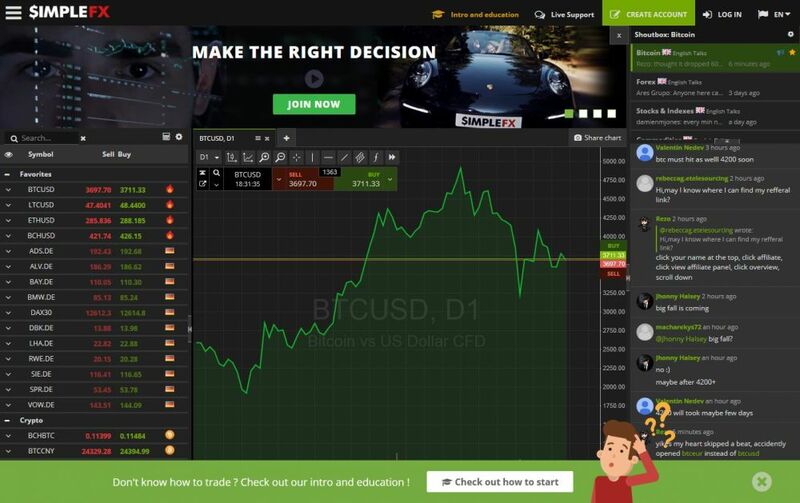 Are you looking for a Bitcoin trading platform that not only accepts Bitcoin but trades the pair as well? 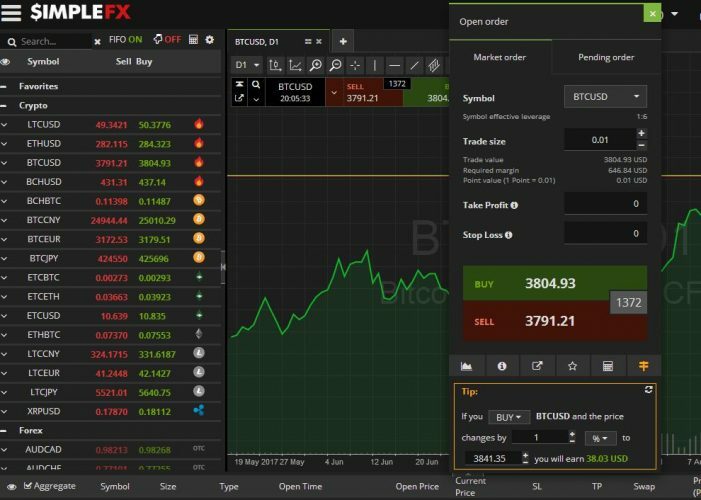 Then you’re in luck since today we will be looking into SimpleFX.com, a trading platform that accepts Bitcoin and welcomes the use of it. 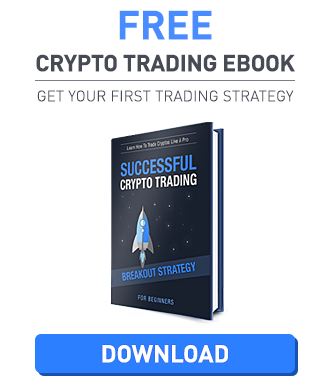 There are a lot of trading platforms out there today that accept Credit Cards but there is only a handful of trading platforms that accept crypto currencies, or in general, Bitcoin. Today, we will create an account with them, try and do some sample trades if we can, and learn more about this website. SimpleFX, is it a new website with nothing to offer compared to its predecessors? Or is it something special that’s underrated. We will find out together! Right of the bat, this website design is “Hip” if you ask me. They support 15 Languages including English, which is always good in my book. They have been operating since 2014 and located in Saint Vincent and the Grenadines (which is apparently a country in the Caribbean). To create an account, we first need to head to their website. 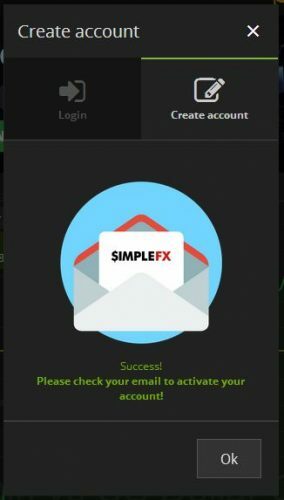 Once on the website of simplefx.com, click on the CREATE ACCOUNT button which can be found on the upper right-hand side of the home page. As mentioned earlier, this website is a hipster! You are able to create an account by providing your email address OR by using your Facebook account, Google Plus account, or your VK account. Since I am not a hipster and of course, we need to keep the anonymity, we will be using our verified email address for this purpose. Provide the valid email address and verify that you are not a Robot and click on Register. Once the authentication is done, a prompt saying that an email confirmation was sent to the email address provided. When checking your email, make sure that you check your Spam/Junk folder as well since I found mine at the Spam Folder. Click on the Verify link and you will be redirected to their website. Once you have created an account with them, you will be automatically logged into a Live Account. Live account means that you will be trading real money and currency on this account. Good thing that here at SimpleFX, they do have a Free Demo Account wherein you are able to play around with and get familiar with their services. To create a Demo Account all you need to do is click on your account profile. Select the Accounts tab and you will be redirected to a blank, black-screened window. On the upper-left corner of the screen you are able to see three tabs; these would be Live Accounts, Demo Accounts, and Money Operations. Click on the Demo Accounts tab and you will be able to create a new demo account under your original login credentials. Click on +Add Account and a separate tab will open up. On this tab, all you need to do is select the currency you want to have in your Demo Account, set the password and you’re good to go! Once you’re logged into your Live/Demo account all you need to do is to click on the pair that you are planning to trade with. Pairs can be seen on the left-hand side of your account screen. Here you are able to choose from Forex, Crypto, Indices, Commodities, Precious Metals, Equities, and others. For sample purposes, the screenshot you see above shows the BTC/USD pair. On the Market Order tab you are able to type in your ideal trade size, the available leverage, and trade value. On this particular tab you are also able to change or put a limit on your profit and put a cap on your losses. What’s great is that you are able to use the calculator that is provided on the lower part of the tab. Once a position is made, this will show up in the space below. Your standing positions can also be edited with what you think would be the best selling price of the position and change the loss cap if needed. One great feature about SimpleFX.com is that they have an active live chat available to all registered users. Some of the website regulars often use the chat box to predict outcomes which in return you can use to your advantage. What I have noticed about recent updates made by trading platforms is that they provide education the best that they can. I mean, these are merely trading platforms and not some serious educational websites that teach you how to trade and make money out of trading. The effort is really felt when it comes to educating new comers to this niche. SimpleFX made sure that they would get a piece of that pie and made sure that their customers are well-informed when it comes to trading. They have educational articles, videos and so much more that you are able to read and watch through the graduation hat logo located on the upper right corner of your account page just right beside their customer service button. Now that we’ve looked into what we need to know about account creation and trading, it is the perfect time to know how to deposit and withdraw money from your account! 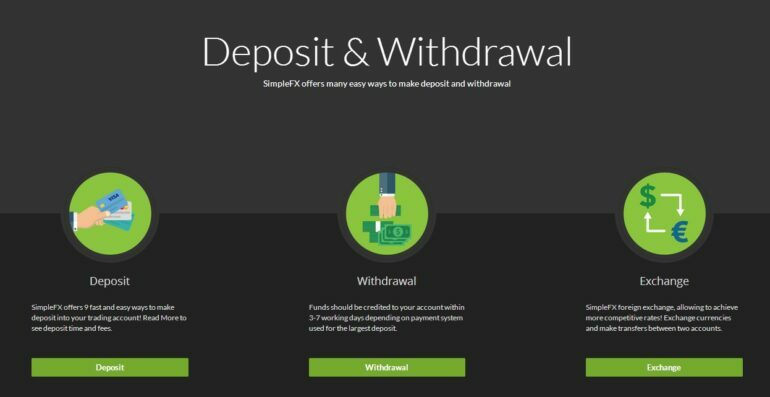 Head on to the upper left corner of your account screen and click on the three bars right beside the logo of SimpleFx.com and select Deposits and Withdrawals. Credit Card – Minimum Deposit is USD 10 and the maximum deposit is USD 4000. Skrill – Minimum Deposit USD 20 and there is no maximum deposit. Neteller – Minimum Deposit is USD 20 and there is no maximum deposit. Local Payments – Minimum Deposit is USD 10 and the maximum deposit is USD 3000. Wire Transfer – Minimum Deposit is 0 and the maximum deposit is USD 3000. FasaPay – Minimum Deposit is USD 0.1 and there is no maximum deposit. MegaTransfer – Minimum Deposit is USD 10 and the maximum deposit is USD 4000. They do not charge any fees for any of these deposit options aside from your regular bank fee. In addition, cryptocurrencies do not have a minimum deposit and maximum deposit cap. Please be advised that different payment methods only accept limited currencies, to check the deposit currencies click on this link. When it comes to withdrawals, cryptocurrencies do not charge any fees at all and the minimum withdrawal request ranges from 0.001 BTC up to 0.05 LTC. The same payment methods apply for withdrawals, that means that the same names mentioned above are the ones used to withdraw money from your account. Minimum withdrawal fees range from 0 up to USD 10 per transaction. You are able to read more about the withdrawal fees for different methods through this link. When it comes to visiting new websites, what would be the first thing that would go through your mind? Mine would be the available Customer Service support a website can offer. Why? Because this is probably the most important part of a website that does financial transactions on a daily basis! The last thing you would want is to have a website hold your money but you are unable to contact them in the fastest way possible, isn’t that scary? That’s scary enough for me! Here at SimpleFX.com, they do have customer service and it comes in the form of Live Chat Support which you are able to access if you log into your account. This can be found on the upper right part of your account screen; just click on the text bubble logo and this will open up a separate live support tab. You are able to contact them directly through this but if there’s no available agent, the live chat turns into a ticketing system. No phone numbers are listed, which is lame if you ask me. Though their Live Chat is there, it would have been nice to have different channels to contact them at. When it comes to customer feedbacks, I found a few dirty dishes that SimpleFX needs to wash. Claims that they were robbed or that SimpleFX rigged their charts so that they would be able to take all the profit from all the trades. I found a good post regarding this issue here. In general, the website isn’t so bad at all. You get to create an account using Social Media websites and do it literally in under a minute. The options for your positions are great, and they not only accept Bitcoin but they accept Credit Cards as well, what more can you ask? Everything looks pretty decent if you ask me. They have a Demo Account which you are able to enjoy to your heart’s content! Trade with sample pairs and get to know how their services work. Having a demo account ready to be used is always a plus for me. The only smudge would be the negative remarks that I read about the website, alarming thing is that the remarks were made just this year. Without those negative remarks, everything is fine with this website. But I would rather wait for the dust to settle down and the issues to be taken care of before moving into the website and trusting any amount of money with them. I believe my SimpleFX acc was created back in ‘2015’ and was never used f0r trading LIVE(real-m0ney). I was pretty much new to trading & s0, the platform was quite intimidating f0r me@the time! As my awareness(F0rex-Knowledge) started to thrive, I knew I could now easily understand L0T-SIZES! This was probably the hardest thing f0r me to understand during the years relating to trading markets. Now that I’m using $impleFX I’M H0ME BEBE! ;D LTC deposits!? WHAT! GAME 0VA! Using LTC also to trade, is wonderful as it allows to use very little money to get into a tradde PLUS we have up to 500 X Leverage – I ain’t no fool! Also, they have WAY m0re pairs(F0rex/Crypto)to choose from! -Site does lag but much better than when they first started, which is why it’s probably best to use the MT4-5 Platforms f0r this very reason! -Currently there is no option f0r BCH deposits/pairs and 0r having it used as another currency to trade with as well! BCH should be the next runner up f0r this site as BCH is gaining more and more attraction everyday! AND the company ‘BitPay’ had already integrated BCH to their Prepaid Debit-Card along with the 0rig. BTC 0ption. 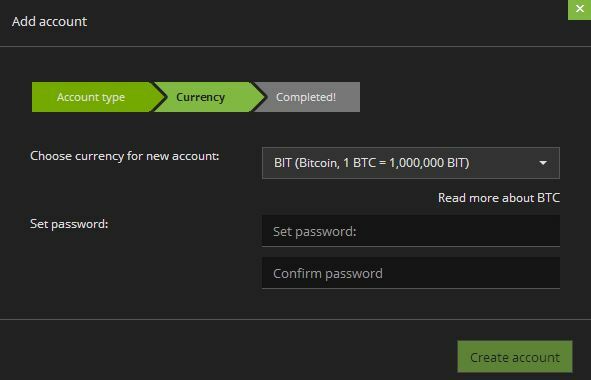 This will make my life much easier so that I can send my profits(BCH) straight onto the card, rather than having to send it(ANOTHER currency) on over to another exchange to then convert. AND ENJ0Y THE CRYPTO LIFE! Thanks for your review Tradz!